It's official - hammocks help you sleep... no wonder I always get so sleepy when I lay in one. 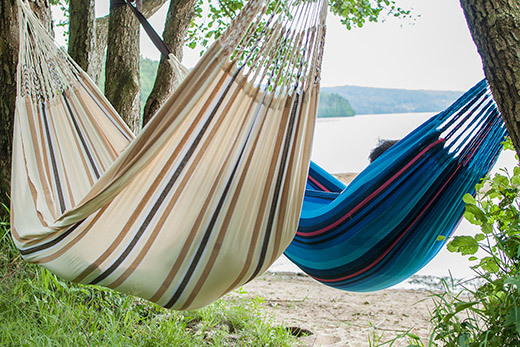 Next time you go to the beach or the park, take at least 2 hammocks with you. It is fantastic to have them side by side... and a great place to hang out and watch the kids play! Shown here is the Cayo Latté double hammock from Hamaca. This is available on www.HammockHeaven.co.uk for just £59.95 with free shipping. The blue hammock is the Iguana Ocean. This is a single hammock available from www.hammockheaven.co.uk for just £49.95. Both hammocks are made in Colombia in the traditional way. They are our most eco-friendly hammocks because they are made from recycled cotton.